Learning the Total Leadership method and producing four-way wins is possible for anyone willing to practice being real, being whole, and being innovative. Leadership can — indeed must — be learned. It's learned by taking mindful action toward a direction you choose, gaining support from people who matter, and reflecting on your experience. There are exercises and activities undertaken by participants in each of the phases of the Total Leadership program. Below you will find a brief description of each phase and free tools and assessments you can use on your journey to becoming a better leader, having a richer life. You are welcome to share them with colleagues, friends, and family. Even better, coach each other as you go through the steps together. The process starts by defining your goals for your Total Leadership experience. Simply address this question: What do you hope to accomplish by learning how to apply the principles of being real, being whole, and being innovative in your life? Then, to set a baseline for the development of your skills, assess your Total Leadership skills with this free online tool. 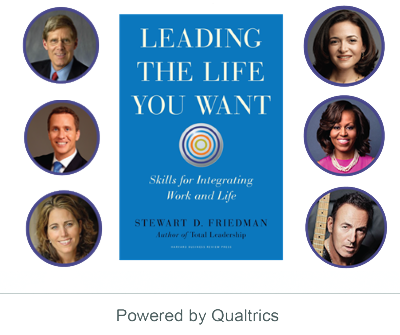 There you’ll find out which of the leaders profiled in Leading the Life You Want: Skills for Integrating Work and Life has similar strengths to yours and you can then share your results with friends and colleagues, if you choose. You’ll also get ideas for actions you can take to exercise the skills on which you want to focus. Acting with authenticity gives you the strength that comes from doing what you love, drawing on the resources of your whole life, knowing you’re creating value for your self, your family, your work, your world. Effective leaders articulate a vision — a compelling image of an achievable future — that inspires them and the people around them. Their everyday actions fit not only with their personal values but also with the values of the groups of which they are a part. Through continual observation and reflection they know their priorities, their strengths and weaknesses. They increase commitment to common goals and they hold themselves and others accountable for pursuing valued goals. In this part of the Total Leadership experience, you explore what it means for you to be real, to clarify what’s important. You start by writing about how crucial events in your past have shaped your values and about your aspirations for your life in the future. Then you take what we call the four-way view by assessing the relative importance of work, home, community and self; how much you actually focus time and attention to each of these parts of your life; how satisfied you are with them; and how well the goals you pursue in them are aligned with each other. Download the Four Way View chart and complete it by (a) recording a number from 0 to 100 in each cell of the first column such that the column total equals 100 to indicate how important each domain is to you, (b) indicating proportionally where you focus your attention in typical week, month, or season, (c) circling the number that best represents how satisfied you are with each domain and overall, and (d) indicating how well you are performing in each domain and overall. (You can do this exercise at HBR.org too). Think about what these numbers mean to you and brainstorm ideas for experiments you could try that would improve satisfaction and performance in all domains. Talk over your ideas with someone you trust. 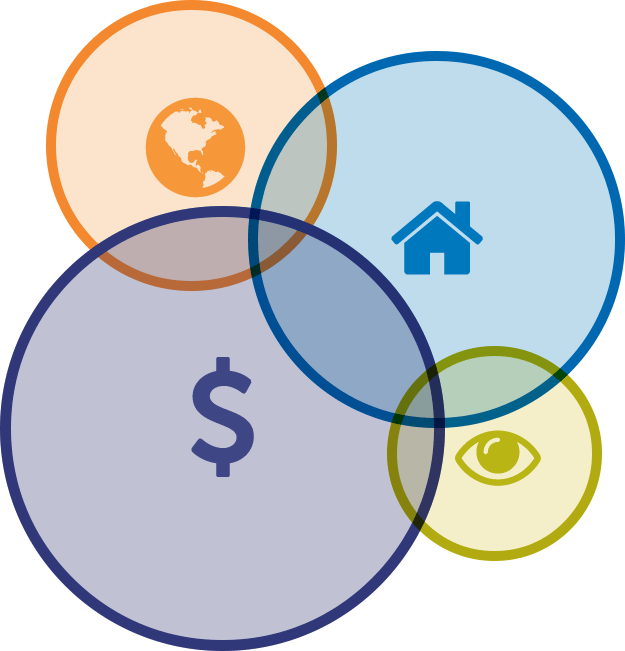 The My Four Circles exercise complements your Four-Way View and helps you identify whether the domains are aligned with your values and goals. The free online tool also helps you generate ideas for experiments that derive from your analysis and you can share your circles and your ideas with others who can help you progress on these ideas for change. Acting with integrity satisfies the craving for a sense of connection, for coherence in the disparate parts of life, and for the peace of mind that comes from adhering to a consistent code. Effective leaders take responsibility for recognizing and respecting the value of all aspects of life. They align the interests of different people in gaining support for common goals. They maintain the boundaries that enable value to be created at work as well as in other aspects of life. They nurture social networks and partnerships that provide the support needed for achieving meaningful results. In this part, then, you explore who really matters to you. First, you identify the most important people in your life and what you expect of them as well as what they expect of you. You think through how these performance expectations affect each other, looking perhaps for the first time at these central relationships in your life as an interdependent system, and asking whether this system has integrity; whether and how the pieces fit together as a whole. Download and complete the Stakeholder Charts Template to assess who the most important people are in all domains, what your performance expectations are for each other, and how these expectations influence each other. Then you think about how you use different forms of communication to connect with these key stakeholders, and then you prepare for and conduct dialogues with each, to verify your assumptions and to see what things look like through their eyes. This is often the most challenging part of the Total Leadership program, and the most rewarding, as you gain new insight about what really matters to your most important people. All this diagnostic work on what matters and who matters most to you generates ideas for innovation. Designing and implementing experiments to act on those ideas happens the next phase. Acting with creativity allows you to adapt to fit new circumstances, gives you confidence to try new ways of doing things, and keeps you vital. Effective leaders continually re-think the means by which goals are achieved; they keep a results-driven focus while providing maximum flexibility (choice in how, when, and where things get done). They have the courage to experiment with new methods to better meet the expectations of people who depend on them. They don’t rely on face time for getting things done, but use it wisely while taking advantage of the flexibility and control afforded by digital communication tools. With a new, clearer perspective on what and who matters most, you’ve set the stage for what is the usually most enjoyable part of the process; being innovative, in which you design and implement smart experiments to produce better results in all parts of your life. Perhaps the most important part of any learning journey comes at the end, when you invest just a bit more time in reflecting on what transpired, in light of your goals, and draw insights for your future development and action as a leader in the next steps on your journey. Assess the impact of your experiments on your performance and ask what worked, what didn’t, and why. Take a fresh look at the expectations of your key stakeholders and at your own values and vision. See for yourself what these insights mean for what you can do to continue your growth as a successful leader intent on having a rich life. And then the process begins anew. To make the principles of Total Leadership become part of your repertoire requires continual practice and discovery, best done in peer-to-peer coaching partnerships, where you have chance to provide mutual support and accountability. And it's surely true that one of the best ways to really learn something is to try to help someone else learn it.